David Cameron and George Osborne then continued with their contradictory statements of a plunging sterling and rising inflation but falling house prices inflation. "If we leave the EU the fall in the value of sterling would be an average 12%." In a world starved of yield with many bond holders in Japan and Germany actually PAYING interest to lend money to the government (bonds), rising UK interest rates would act as a huge financial hoover, sucking in foreign investment into UK bonds which ironically would result in a FALL in UK interest rates i.e. demand exceeding supply. Though of course now post brexit interest rates have done the OPPOSITE to the fear mongering and so are house prices likely to RISE rather than crashing by 18%! 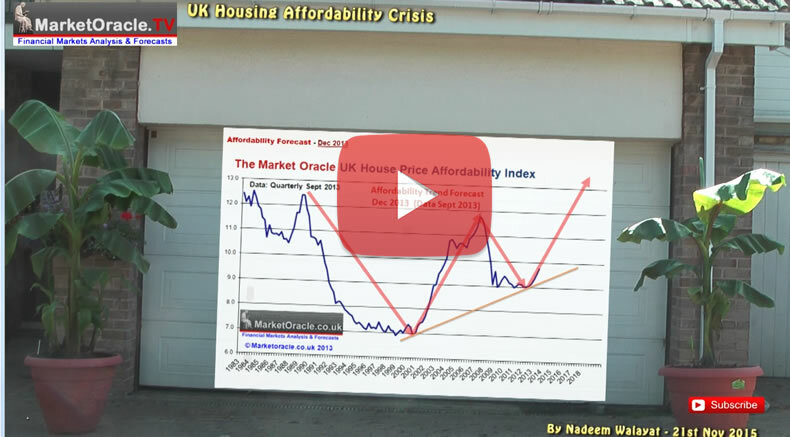 For the fundamental fact that UK house prices in dollars are now 12% CHEAPER! A BrExit discount for potential foreign buyers who primarily will be wondering whether UK house prices will get cheaper in currency terms or should they act to seize the moment and pick up a bargain now. So in my opinion foreign demand will be STRONGER for UK property going forward and the only delay is in investors waiting and watching for sterling to stabilise which it seems to be doing so in the £/$ range of 1.30 to 1.38, and the longer sterling holds this range or trends higher then the greater will be foreign interest in buying UK property, especially if the doom merchants headlines for a house price falls fail to materialise. And many of those proposing a drop in UK house prices or worse are the same who have been wrongly calling for its imminent demise for years! The most recent UK average house prices data (£216,017) is showing just a 3.2% deviation against the forecast trend trajectory, which if it continued to persist then in terms of the long-term trend forecast for a 55% rise in average UK house prices by the end of 2018 would then translate into a 7% reduction in the forecast outcome to approx a 48% rise by the end of 2018. UK house prices momentum gong into the EU referendum had significantly slowed from + 11.1% for March 2016 to +8.7% for May 2016. I expect momentum to continue to slow over the next few months, probably bottoming out at above 5% before rising again towards +10% by the end of thus year. Thus UK house prices will continue to defy the highly vocal perma-wrong crowd who have been proclaiming that a house prices crash is imminent for the past for 4 years! Who I am sure will be jumping up and down like demented rabbits as they assume the slowdown in momentum is anything other than just that a slowdown in the rate of the annual increase in house prices, which I still expect to remain strongly positive i.e. at above +5% and end 2016 trending back towards 10%. Whilst London will see a more severe slowdown in momentum than the rest of the UK and actual year on year falls in some over priced locations and property types (flats), as per my in-depth analysis of December 2015 that had expected London to take a hit but overall UK average house prices to continue trending higher for 2016, a trend that should become apparent over the coming months. The bottom line is that UK house prices are going to continue to get ever more expensive where those who are waiting for a crash to more affordable levels will continue to regret not buying as the only way housing can even start to become more affordable is if the UK literally triples the number of new builds each year from approx 140,000 per year to 400,000, something that is just not going to happen as it would literally mean the government undertaking to build a new major city EVERY YEAR! Instead it has been over 40 years since the last new town let alone city was built. Therefore the UK housing crisis is not just one of the inability of the housing market to cope with current demand, but as the earlier housing affordability trend graph illustrates that the crisis is going to get much WORSE with each passing year, which ultimately means an social EXPLOSION of some kind, maybe not a revolution but it's not going to look pretty! And where BREXIT is just the first rebellion of the people against the establishment that want to import cheap labour that the tax payer picks up the bill for in terms of in work benefits and the people of Britain pay the price for in terms of the slow motion collapse of society as literally each service after service FREEZES! Hence why the housing crisis cam ONLY be addressed AFTER Britain has LEFT the European Union, which still remains several years away.